ISO 55000 | SwainSmith, Inc. If you want to maximize the value of your physical assets, technology alone is not enough. You need processes, leadership, and standards. ISO 55000 provides all of that. It formalizes asset management, giving you a strategic and disciplined approach to reducing costs and improving performance. SwainSmith knows how to fully leverage an ISO 55000 approach to asset management. Our tools, domain expertise, and experience lay the foundation for creating value on a long-term and sustainable basis. ISO 55000 is the international reference standard for the optimal management of physical assets. It was published in 2014 in response to industry demand for good practice standards in the field of asset management. ISO 55000 defines good practice in the whole life management of assets. It is applicable to any organization where physical assets are a key or a critical factor in achieving business goals. Aligning to ISO 55000 enables an organization to achieve its objectives through the effective and efficient management of its physical assets. The central recommendation of ISO 55000 is that a business should establish a documented system for managing its physical assets, referred to as an asset management system. An asset management system is a management system (like an ISO 9001 quality management system) that is used to coordinate and control asset management activities. It ensures that everyone knows who does what, and how things are done, so that tasks are performed the same way across the organization. It provides the consistent, deliberate practices that are needed to manage physical assets effectively and efficiently. An asset management system coordinates the interrelated elements of an asset management operation (processes, roles, technologies, etc.) so that a business can deliver on its goals. SwainSmith helps clients get the most out of their EAM software by “systematizing” the asset management operation. Our ISO 55000 asset management systems reduce MRO costs, improve asset performance, and help you access the EAM information you need on a long-term, sustainable basis. 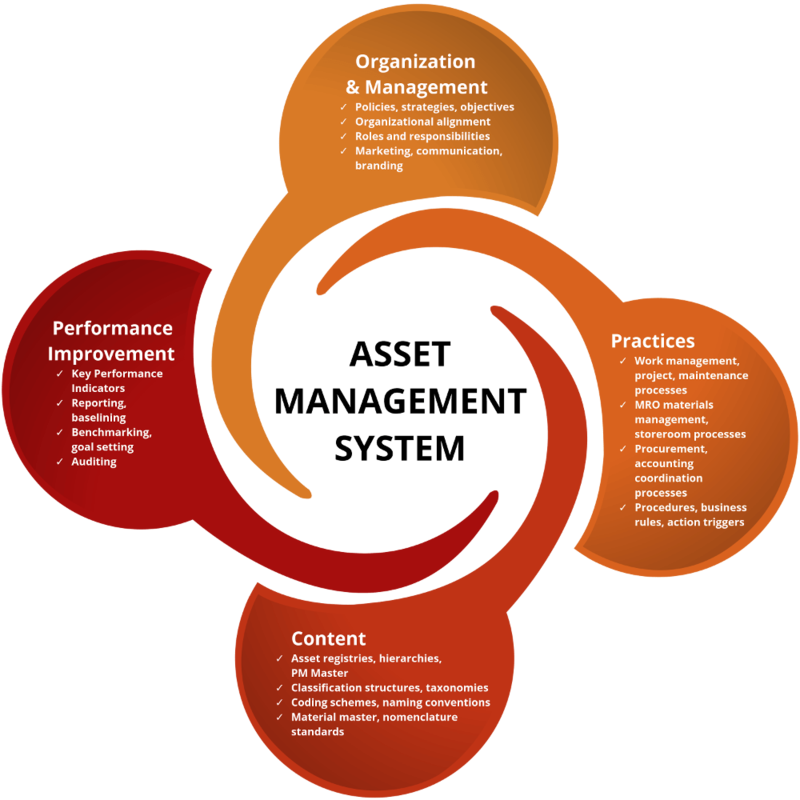 Helps an organization “turn things around” through disciplined practices, long-term planning, and effective change management. Demonstrates to customers, owners, employees, regulators, and other stakeholders that the organization’s assets are in good hands. Provides assurance that an organization’s objectives for its physical assets can be achieved consistently and sustainably over time. Enhances customer satisfaction through improved performance, reputation, and control of service delivery. Improves risk management, HSE performance, and corporate governance – while leaving a clear audit trail. Optimizes return on investment for physical assets, capital projects, and asset management technologies (EAM, CMMS, IIoT, etc.). Speeds up improvements in the short term while laying a solid foundation for future success. SwainSmith is a leading ISO 55000 consulting firm. We have implemented ISO 55000 compliant management systems for some of the world’s largest organizations in both public and private sectors. In fact, we were doing things the ISO 55000 way before ISO 55000 existed. Since we started in 1997, our approach has been the same one that ISO 55000 advocates: Establish a documented organizational model for asset management, with clearly defined roles and processes, and the value will follow. The strength of that approach is borne out by our clients’ success. We’re proud of our numbers, which include an average 10–30% reduction in maintenance costs and 3–5% improvement in equipment availability. Those numbers are backed up by deep domain experience. Our principal, Tracy Smith, served on the committee that helped to develop ISO 55000. He was also an Endorsed Assessor and Certifier for PAS 55, the predecessor to ISO 55000. We leverage 20 years of consulting experience, an insider’s knowledge of ISO 55000, and our SynergyTM solution to solve clients’ toughest asset management challenges. Achieve ISO 55000 alignment fast with SwainSmith’s asset management system in the cloud. Synergy is a documented operating model (i.e., regime) for a business’s whole asset management operation. A product of 20 years of development, Synergy contains over 300 industry-proven policies, processes, organizational charts, responsibility matrixes, data conventions, KPIs, and other key elements of asset management success. Learn what ISO 55000 requires and how it can benefit an asset-intensive organization. Uncover the hard- and soft-dollar savings of an ISO 55000 approach to asset management. Why do so many CMMS and EAM software implementations fail to deliver useful information? Lack of alignment is guaranteed to derail your EAM software implementation. Master data and coding structures are critical to EAM software performance. Documented practices are critical to standardizing physical asset management and achieving success. If you don’t audit your EAM/CMMS implementation, it’s hard to ensure ROI…. Don’t have time for a customized workshop? Watch this pre-recorded webinar when it fits into your schedule. Learn about the basics and benefits of an ISO 55000 asset management approach. What Does an ISO 55000 Asset Management System Look Like? Don’t have time for a customized workshop? Watch this pre-recorded webinar when it fits into your schedule. Learn how an ISO 55000 management system approach to asset management creates real value. Ready to find out what ISO 55000 can do for you? SwainSmith has been helping clients create value with an ISO 55000 approach to asset management for 20 years. Contact us today for a complimentary 30-minute discussion of your business challenges and needs.